When I was a kid my parents took me to many of the amusement parks that there were in Holland back then. Today there are many more of these amusement parks, and the attractions of these parks today are very different from what children my age got to do and see. I know what I am talking about, because I am a father of two children, so I get to see these modern amusement parks too. Involuntary! If there is one thing I don’t find amusing it is standing in line these attractions that make you sick, and eating the kind of non-food they serve there. Well, I get sick, my children don’t. Our children love to hear stories of how things were when I grew up. Just making lists of things that did not exist 35 years ago is enough to drive them wild: (no) cell phones, CD’s, DVD’s, gameboys, skates, computers, television series for children, etcetera, etcetera. In my Wall of Records there is enough vinyl made by Dutch amusement parks to fill a CD. Not that I think it is worth the effort: most of these records are totally uninteresting, unless you have a nostalgic inclination and a warped mind like mine. Among my favourites are the 45 ‘s of Madurodam and De Efteling. Madurodam is a small park in The Hague, where you can see miniature replica’s of some of the buildings in Holland. The park still exists, but I have not been there in 35 years. 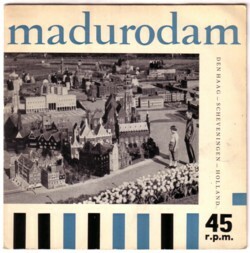 On the 45, that was made by Madurodam in the 60’s, are two versions of a hymn, which I am afraid was not written as the joke that it sounds like today. For most Dutch people my age De Efteling will be the park that they remember most of all. De Efteling was originally a fairy tale theme park, designed by the Dutch artist Anton Pieck. 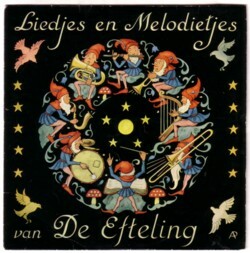 He also draw the sleeve of the first 45 that De Efteling released; later they made an endless series of LP’s with versions of the famous fairy tales. On this 45 are a song and a story, both in Dutch. Here is the song.